I enjoy discussing characters, and so I wanted to point out my recent post at Comparative Geeks today. I went to see the Ant-Man movie on Friday and I loved it. So much it seems, that I can’t stop talking about it! I wrote a review on Sourcerer, and I plan on reviewing the latest comic featuring the delightful Scott Lang. But I’d love to know your thoughts – on Scott, or on superheroes in general. Stop by and join the conversation! Powers: Thanks to Pym Particles, Scott (Ant-Man) can shrink to the size of an ant. He can also communicate telepathically with insects. When he shrinks, he retains his human strength. Abilities: Scott has expertise in electronics. Scott Lang is the current Ant-Man, though he achieved the title by unorthodox means. He stole the Ant-Man suit from Dr. Henry (Hank) Pym, in order to save his daughter’s life. Not the first time Scott stole in order to support his family. He turned to crime when he was no longer able to support his wife and daughter, and became a skilled thief as a way to make ends meet. Of course this path didn’t end well, and Scott spent a time in prison. Are you a fan of Supernatural? Of course you are, who doesn’t love the Winchester Brothers! I’m over at Comparative Geeks today and tomorrow giving an overview of the show, so pop on over and let’s have a chat. If you didn’t catch my reviews of Daredevil, you can find them here. Supernatural has been running for ten years, and remains one of my favourite shows. Fact is, there’s a lot to like. Let’s start with the array of supernatural creatures; wendigos, witches, ghosts, vampires, demons, werewolfs, killer clowns – you name it, they’ve had it. The Winchester brothers have come up against urban legends, creatures from folklore, biblical dieties, and have even ventured into an alternative reality or two. Who can forget the time they fell into a world where alternate versions were actors playing the Winchesters in a television show called Supernatural – yep, it takes a moment or two to get your head around! 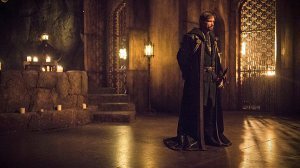 I decided to reblog my Arrow review here today because, even if you’re not a fan of the show, there’s some amazing content on Sourcerer – you’re sure to find something to tickle your fancy 😀 Happy Friday. So much happened in this week’s episode that I don’t know where to start, so while I want to jump right to the end and the rather explosive cliff-hanger, let’s start at the beginning instead and take things one step at a time. Not literally, since that’s hardly my style, but there is a method to my madness! Nanda Parbat opens with Ra’s in the Lazarus Pit, and there really is no question that this is the regenerative pool from the comics. Despite the fact Ollie didn’t get to swim in the mystical waters, I’m convinced the pit has its part to play, so I’m being patient.